If adrenalin is your drug, then nothing beats the aqua thrill of hurling downstream while fighting off mean rapids. 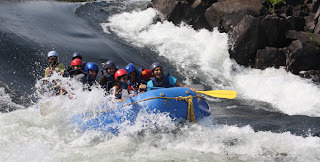 Kundalika, Kolad has emerged as one of the most attractive and best rafting destinations in Maharashtra, a sport that has gained massive popularity with the young and living of Mumbai. Jungle Lore conducts rafting in Kundalika every weekend.